It’s nolonger just a place for your family and friends to share old and embarrassingphotos of you every Thursday. As amarketer, you need to learn how to properly leverage these platforms to youradvantage. Being active on social media is huge, and it’s absolutely necessaryfor your survival. But thatalone won’t automatically make you successful. You also need to stay up to datewith the latest marketing trends andapply them to your business. Today,marketing and social media go hand in hand. As we near the midway point of 2018,I’ve taken the time to identify the top social trends of the year to date. I analyzeddata from previous years and determined what trends saw a steady incline. Plus,even though the year isn’t over yet, I was able to see which new developmentswere the most prominent in these early months. I predictthat these trends will continue in the coming year. It’s important for you andyour brand to stay on top of things right now. Live videocontent made big waves in 2017. In one of my previous blog posts, I explainedthat you should jump on the live videobandwagon. It shouldcome as no surprise that this continues to be a popular trend in 2018. 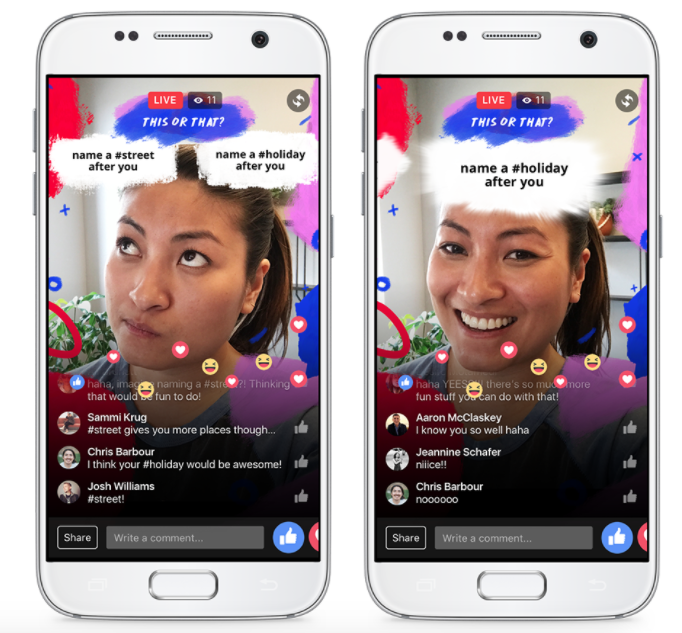 In fact,live video content has become so popular that roughly 95% of brand executivessay it will be a crucial part of their 2018 marketing strategy, according toa recent study. Consumerslove it. Research shows that80% of audiences prefer watching live video from brands as opposed to reading ablog. And 82% of consumers say they would rather watch live videos than readsocial media posts. As a result,the most popular social media channels have implemented live streamingoptions. Brand marketers aretaking advantage of this. 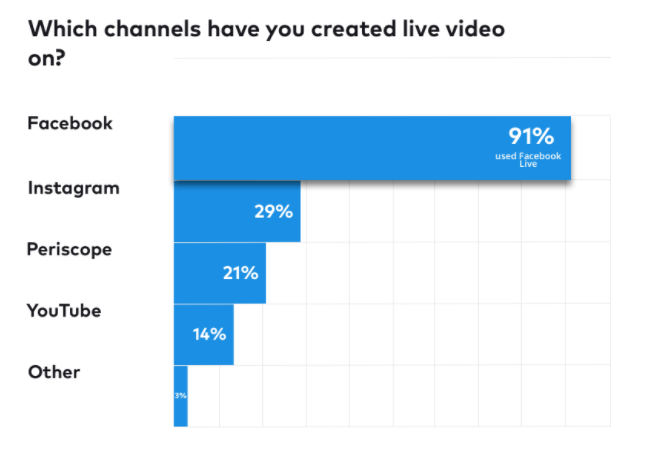 When itcomes to live streaming, Facebook leads the way, according to the 2018 state ofsocial media report from Buffer. In 2017,only 31% of businesses broadcasted live videos to promote their brands. Iexpect to see a much higher percentage by the end of this year. Marketersaren’t the only ones taking advantage of live streams. Regular people sharelive videos to interact with their friends and family on social media. Theincreasing popularity of live video means your company needs to get on boardwith this trend right now. Businesses need to recognize how this trend can helpincrease engagement with social media followers. Start goinglive on all your distribution channels. Respond to user comments in real time. This willhelp you maximize your reach and generate new leads for your company. Internetchatbots have been around for a long time. They go all the way back to the daysof AOL instant messenger. But likeeverything else, they are evolving. Now chatbots are being integrated withsocial media platforms. Businessesare using chatbots to communicate with their customers on social media. Thistrend is growing at a rapid rate. In the first year ofthe new Facebook Messenger platform, we saw the number of chatbots jump from33,000 to more than 100,000. These botsrecognize word phrases sent by users. Their automatic responses are based onhow they are programmed. 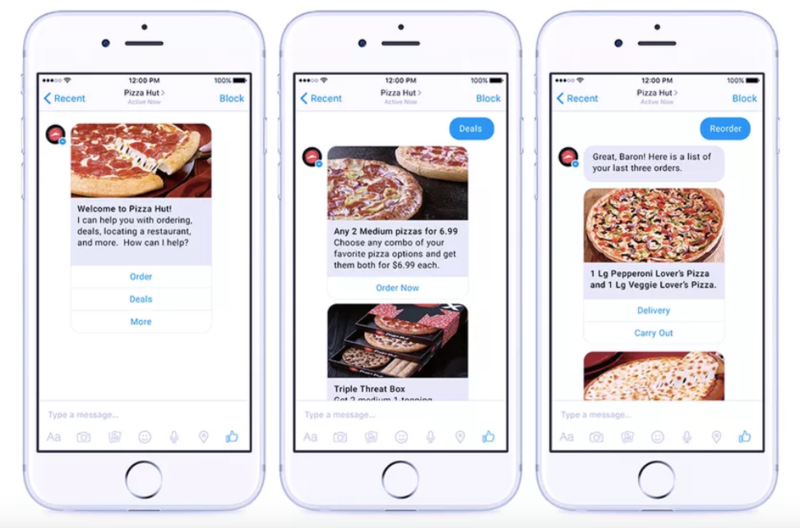 As you cansee from this Pizza Hut example, these bots can be used directly to drive moresales and increase revenue streams. I believe weare going to see more businesses take advantage of these tools by the end of2018. In fact, a recent survey suggeststhat roughly 80% of marketing executives have used or plan to use chatbots by2020. It’s awinning solution that’s a cost-effective alternative to paying real customersupport representatives. It’sestimated that chatbots are going to save businesses in the healthcare andbanking industries a whopping $8 billion peryear by the year 2022. That’s compared to $20 million in 2017. Sure,nothing can replace the personal touch of a human response. Well, at least notyet. But these chatbots out there right now are certainly on the right track. Influencermarketing isn’t a new concept either. But the way that it’s being used onsocial media channels is definitely changing in 2018. Morespecifically, companies are starting to partner with micro influencers to increase theircredibility. What exactlyis a micro influencer? They are people on social media channels who have astrong following but don’t have a celebrity status. While thereis no exact threshold, micro influencers typically have anywhere between 1,000and 90,000 followers. Once we start to reach the hundreds of thousands offollowers line, we are entering macro influencer territory. And anything higherthan a macro influencer is considered to be a celebrity. Researchshows that micro influencers have 60% higher engagement rates than traditionalcelebrity influencers. You can also expect to see 22.2% increase in averageweekly conversions from this marketing tactic. Anotherreason why brands are so drawn to micro influencers is because they arecost-effective compared to other advertising expenses. This isstill a relatively new trend, so brands and influencers alike are unsure of howto come up with a standardized pay scale. As of now, it’s anything goes. I’ve seensome businesses that don’t even pay their influencers. They just send them freestuff for social media posts. But as wecontinue moving forward in 2018, I’m expecting micro influencers to be morebusiness savvy and demand pay for their efforts. They knowtheir followers trust their opinions. So don’t be hesitant to spend money oninfluencer marketing as the year continues. It’s 2018,so businesses know they need to have an active presence on social media. Theyhave profiles on multiple platforms and update them on a daily basis. While thisis definitely necessary for survival, it’s not quite enough. Companiesthat want to take their social media strategies to the next level also pay foradvertisements. Facebookalone has more than six million advertisers onits platform. In September 2017,Instagram hit two million monthly paid advertisers. That’sbecause it’s become very easy to set up ads to target a specific demographic.It’s hard for businesses to turn down this type of precision in targeting. 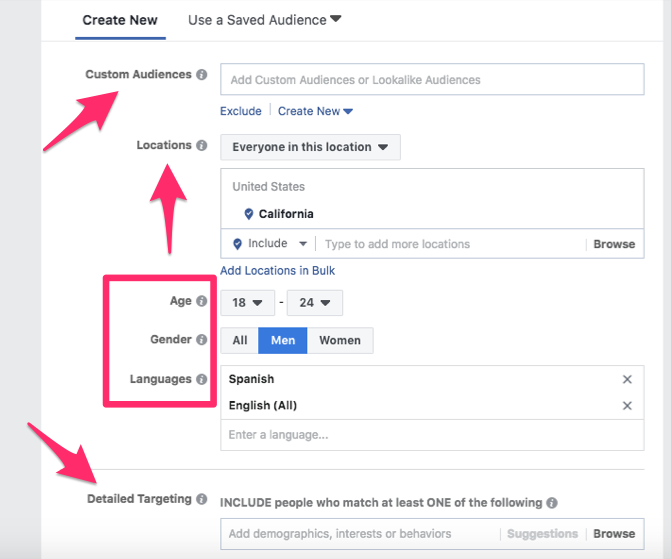 In additionto being able to reach such a precise audience, Facebook also makes it easy foryou to set your budget. You can set it up on a daily or weekly basis. It’s alsopossible for brands to manage their budgets based on the lifetime of each ad. There arealso many different options for the type of ad you want to run. It’s easy toexperiment to find out what works best for your company based on thedemographic you’re targeting. Research shows thatby the year 2020, social media advertisements will surpass newspaper adspending. I anticipatethat more companies will allocate a larger portion of their marketing budgetsto paid social media ads in 2018. Socialplatforms are listening to your conversations. Whether you want to believe thisor not, it’s the truth. I knowyou’ve seen it before. You’re talking about something with your friends andthen you see an advertisement for it on social media. Creepy? Yes.But that’s the reality of the world we live in right now. Marketingsolutions like Sprout Social offersocial listening tools to help brands analyze various audiences. There aremany ways in which businesses can take advantage of social listening. It gives youthe opportunity to see what consumers say about your company. But you can alsouse this tool to monitor relevant keywords or hashtags used on social media. You can usethis data to adjust your marketing strategy accordingly and make sure you’retargeting the right audience. User-generatedcontent is basically like free advertising. It’s one of the best ways to grow your business by doing lesswork. Getcustomers to talk about your company. Encouragethem to use hashtags and post about your brand on social platforms. One of thesimplest ways to accomplish this is by posting user content to your company’sprofile. If people seeyou are willing to feature user photos, more people will post about you in aneffort to be selected. 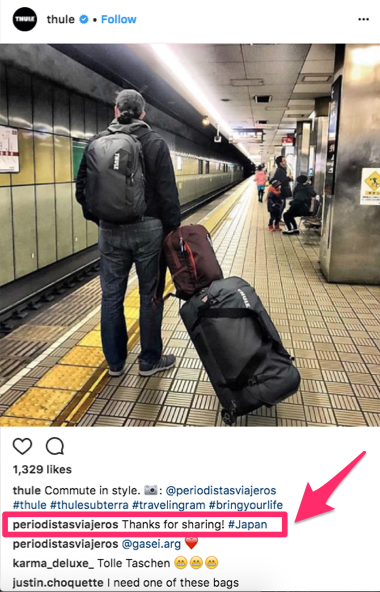 As you cansee from the comments section, the user who shared this photo even thankedThule for posting their content. Now morefollowers will be encouraged to do this as well. It will broaden the reach oftheir products to a wider audience. When acustomer posts about your company on their personal profile, it exposes yourbrand to all of their followers. Some of these people might not even know yourbrand exists. Plus, peopletrust recommendations from their friends and family. That’s whyleveraging user-generated content is a top lead generation strategy. Socialmedia platforms are the perfect distribution channel for this type of content. Augmentedreality takes something that’s real and alters it using technology. One of thebest examples of augmented reality successfully applied to the consumer marketwas with the Pokemon Go gamingapp. The appaccessed the user’s camera and added fictional elements to the screen. But now,social media channels are implementing augmented reality on their platforms aswell. I’m sure you’re familiar with Snapchat’s face filters. Facebookjumped on this bandwagon as well with their camera effects platform. They aretaking augmented reality to a whole new level with these features. They evenbuilt an augmented reality studio for developers to design unique animations. Thesefilters respond to motion and interactions in real-time, even during livestreams. SinceFacebook also runs Instagram, it’s safe to say these types of options will beavailable on that platform as well during 2018. I’mexpecting to see big changes in social media augmented reality in the nearfuture that will be much more impressive than just a dogface filter. If youhaven’t heard of ephemeral content before, it doesn’t mean you’re not familiarwith it. Thedefinition of ephemeral content is something that is short-lived, lasting forup to 24 hours before disappearing forever. Of course,I’m referring to things like Snapchat and Instagram stories. After Snapchatcame up with this concept, Instagram quickly recognized its popularity andimplemented it on its platform as well. The reasonwhy short-lived content is so popular is because people feel as though it ismore authentic compared to a traditional sponsored advertisement. Users loveit and add such content to their personal profiles on a daily basis. But brandsneed to take advantage of this as well. It’s a greatalternative to live video streaming, but it has similar effects. It’s anopportunity for you to post several times throughout a day without spammingyour followers’ timelines. For example,you may not want to post five pictures and videos per day on Instagram. Userswho follow you may perceive this to be an annoyance. In fact,posting too frequently on social media can cause people to unfollow your profile. But addingnew content to your story isn’t as annoying because it doesn’t take up space oneveryone’s timeline the same way a picture or video would. Plus, thesetypes of stories create the fear of missing out. If yourbusiness starts to regularly share ephemeral content, users will make sure tocheck back frequently to make sure they aren’t missing out on anything. I’drecommend using this strategy to run flash sales or other promotions to drivesales. We’re going to see more businesses as well as regular people add more short-lived content to their social media profiles. Socialplatforms are changing their algorithms. This is impacting what users see ontheir timelines. As a result,homepages and timelines aren’t flooded with as many posts and ads from brands.Instead, posts from family and friends are being prioritized. In previousyears, these algorithm changes havecaused organic reach on Facebook to drop more than 50%. So you can’trely on all your social media posts to drive traffic and clicks to yourwebsite. 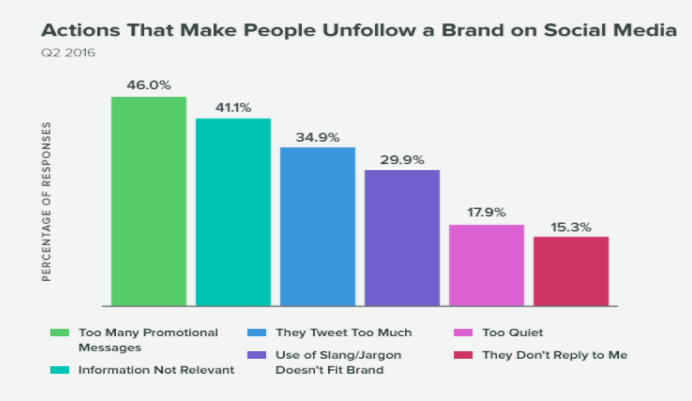 That’s whybrands need to come up with alternative social media marketing methods such aspaid ads and micro influencers to increase referral traffic. Nobody canafford to ignore social media anymore. It’s become a regular part of oureveryday lives. Ten yearsago, small business owners may have thought it was unnecessary to build apresence on social media, but now they are all realizing how important it isfor staying competitive. Infact, 52% of small business owners postto social media on a daily basis. 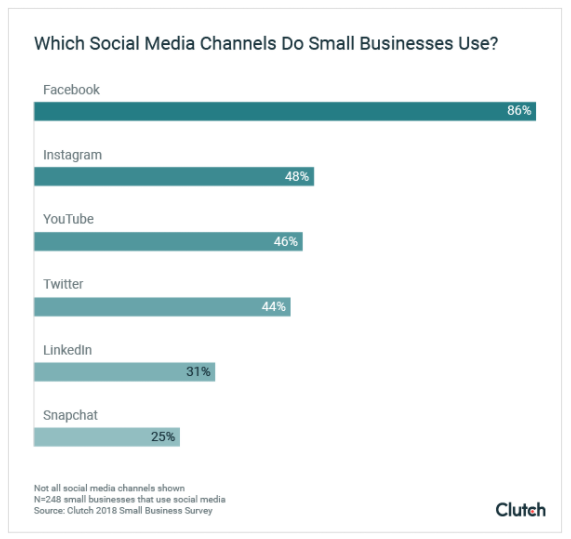 WhileFacebook is still the most popular option, other social channels are seeing anincrease in the number of small business users. With so manyplatforms to manage, business owners are being forced to change the way theyoperate. They arehiring social media marketing managers and using time-saving tools tohelp manage and schedule their posts with automation. Businesseswithout active social media profiles will struggle to survive in 2018. Developmentsin social media are constantly changing. As amarketer, you’ve got to stay up to date with the latest trends to keep yourfinger on the pulse and effectively reach your target audience. Based on theresearch I found, I was able to narrow down the top ten social media trends tokeep your eye on in 2018. Use thislist as a reference and guide for positioning your marketing strategy. I’ll eventhrow in a bonus one for you. Although this isn’t necessarily a trend, it’smore of a prediction. I thinkTwitter is going to make some big changes in 2018. Unlike the rest of my list,it’s more of a gut feeling as opposed to a fact-driven statement, which is whyI left it out. Use thisinformation to your advantage moving forward in the second half of this year. What social media trends willyour company focus on to generate leads and drive conversions in 2018?